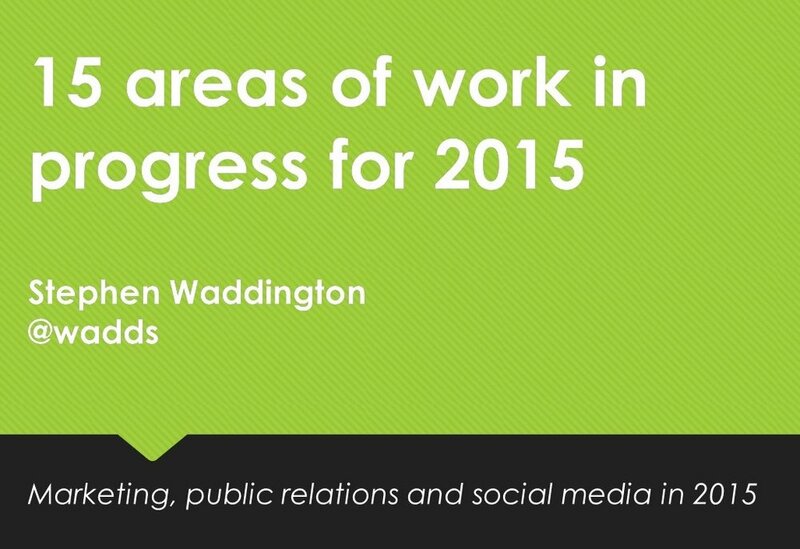 Here are 15 areas that I'm thinking about in my day job at Ketchum as we head towards 2015. They're not so much predictions for the coming 12-months, as work in progress. All 15 areas point to a combination of opportunity and hard work in 2015. There's never been a more exciting time to work in our business. Happy New Year. Traditional marketing models based on age, gender, location and income no longer work. Marketing segmentation was never that simple but in 2015 social media subvert all norms and hierarchies. Listen, and I mean really listen, and then let's have a conversation based on what I say, and more importantly, what I do. This isn't a throwback to CD ROMs and the 90s but is instead a nod to channel integration. I met a radio presenter last month who said social media had given his career a shot in the arm and had become almost as important as his daily broadcasts. The feedback loop and direct relationship with an audience created by a combination of media is incredibly potent. Choose your media wisely. Stories in 2014 of the death of the social network giant were wholly unfounded. Facebook is truly becoming a utility. Now a decade old it has 850 million daily users (September 2014). It's like the phone network but much more powerful. Facebook’s understanding of human relationships is incredible fodder for marketing and public relations, psychology, and in time, history itself. There's a game that I play whenever I have an idle five minutes. I tweet brands that sponsor content on Twitter and ask them a question. Do it and see how often you get a response. The use of industrialised marketing tactics in social media has got to stop. Consumers are starting to fight back and this approach certainly won't work in messaging networks. Publishers and brands are turning off comments across the web. That's because conversations take place across the social sites that readers choose and are rarely on the original publisher's site. I use a WordPress plug-in on my blog to hoover up comments from across the web. You could always make my day and leave a comment below with your thoughts about this blog post. Brands are increasingly becoming over enthusiastic on social networks in a bid to seize the moment. This issue particularly relates to the rise of so-called content marketing. The results are polarised between the minority of campaigns that are rooted in listening and engagement, and the majority that make a lame effort to tame the zeitgeist and churn out bland content. A burgeoning tool market has emerged to support campaign planning across fragmented forms of media and devices. Be careful as there's barrel loads of snake oil and solutions looking for a problem. Think hard about your workflow and how you can best integrate tools to deliver against your campaign objectives. Challenge vendors to demonstrate how their tools can help you deliver the outcomes that you need. The best advocates for an organisation are almost certainly the people on the payroll. Yet most organisations gag their employees with policies and rules. Equal effort should be applied to external and internal publics. My tip would be to always start with your internal stakeholders and work out. Upgrading skills to work across all forms of media is an ongoing work in progress, much like our business itself. We're moving from being generalists to having broad knowledge of our discipline and specialist knowledge in an area such as research, planning, strategy or content. Never stop reading or learning. If you can't show the return on investment for your work you can't expect to receive appropriate remuneration for your effort. It's not rocket science; it's basic economics. AMEC's Valid Metric Frameworks and Google's channel attribution model are good starting points. Organisations without a clear vision and values will really struggle in an era of fragmented media. There's simply too much noise. The purpose of an organisation should be rooted in its values and core to every aspect of its communication. Values should define what an organisation says and does as much as what it doesn't. Public relations increasingly has a role in every area of an organisation. It's shifting from the communication department to human resources, customer service, sales and product development. It is the ears, eyes and mouth of an organisation, and increasingly the conscience.